McLaren Senna, the ultimate road-legal track car from McLaren Automotive, will be making its Latin American debut at the 2018 São Paulo International Motor Show between November 6-18. The car will be a key component of an emotive display celebrating the story of the Brazilian racing legend which also features the MP4/6 Formula 1 car. 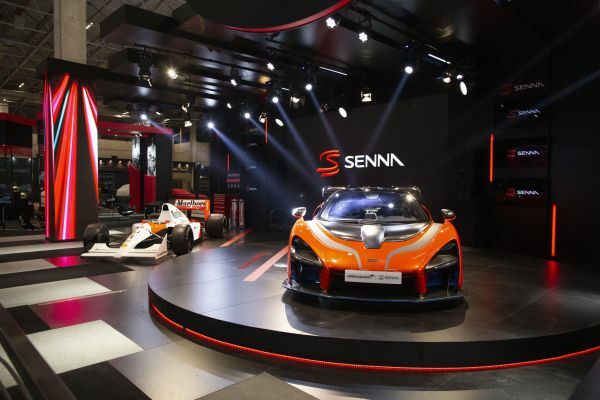 McLaren customers and fans will be able to see the McLaren Senna and celebrate the story of the man who inspired it on the Senna Brand’s stand #E-289. Brett Soso, Managing Director – Middle East, Africa and Latin America, commented: “We are honoured to be working with Senna Brand to debut the McLaren Senna in Latin America. The spirit of Ayrton Senna has always been alive at McLaren – with whom he won all three of his Formula 1 World Championships. True to the legendary abilities of the racing driver whose name it bears, the McLaren Senna is the ultimate McLaren road-legal track car. It generates 800PS (789bhp) and 800Nm (590lb ft) from its 4.0-litre, twin-turbocharged V8, which in combination with 1,198kg of dry weight and 800kg of downforce translates to staggering performance. The McLaren Senna can cover 0–100km/h (62mph) in 2.8 seconds; 0-200km/h (124 mph) is achieved in just 6.8 seconds and a standing quarter-mile (402m) in only 9.9 seconds. McLaren Automotive is currently present in four Latin American markets - Brazil, Chile, Mexico and Peru. The brand operates through a network of dedicated retail partners including McLaren Mexico City, McLaren São Paulo, McLaren Santiago, as well as an aftersales facility in Peru, McLaren Lima. McLaren São Paulo has been operational from the beginning of 2018 and is managed by a local partner, Eurobike. from a brand new, state-of-the-art showroom situated in the prestigious Vila Olimpia. This impressive facility features a wide range of new and pre-owned vehicles on display, as well as a professional service facility with three work bays located within the same premises. McLaren Automotive is the largest part of the McLaren Group. Earlier this year, the company announced its Track25 business plan, which will see £1.2 billion invested in research and development resulting in 18 new models or derivatives by 2025. The annual production is set to increase to around 6,000 cars per annum and the company will be looking to add additional retailers to cope with increased demand. For a full list of McLaren retail partners in Latin America, as well as more information on the McLaren Senna and the award-winning range of McLaren sports and supercars, please visit: http://cars.mclaren.com/. Rolls-Royce announces "The John Lennon Phantom V"